I recently signed up and joined the Telegraph Business Club, it seemed to be a good venue for some online business networking along with a great list of events to attend. The only problem is actually networking. Ok, so to use the forum, you must click on one of a list of bullet point titles to view the “post”. I did this, found someone requesting help on growing traffic online and using different marketing tactics. Of course I know an angle there ;). So I started searching for a place to leave a comment, a button some text…nothing? “All member feedback is valuable – no matter how big or small. If you want to provide any comments, articles or raise any issues that you want to leverage input from your peers, then send an email to Talk Back. Come on Telegraph what is the point in vetting every comment if you allow anonymous comments, install real forum software and lets get talking. I am a huge sports fan and for me, the Beijing Olympics have been stunning. Watching the 100m final blew me away, I never imagined I would ever witness such a feat in my lifetime. For Usain Bolt to destroy a World record is one thing, to destroy it whilst jogging is simply mind-blowing. I have not missed watching a 100m final live since 1980 with Alan Wells conquering the World in Moscow. My most vivid memories are when I woke at 3am in 1988 to see Ben Johnson destroy Carl Lewis’ dream of 100m gold. This was swiftly followed the next day when we woke to hear of Johnson’s drug test failure. With Team GB setting World Records in the pool and velodrome, it is clear we are in a great position going into the next Olympics in London 2012, let’s hope the athletics team find some investment so we can feature in the showcase events. But after all of this, for me, the most endearing image was that of a broken man. Liu Xiang, the Chinese hero, pin-up and megastar. For the past four years, he has had the entire National look to him for inspiration and hope. He would have won the gold in the 110m hurdles and been the story of the Olympics. The poor guy arrived for the first race carrying a devastating injury. The worst a hurdler can have, an Achilles tendon injury. Seeing him prepare for the race, holding his ankle, almost praying it would magically fix itself is something I will never forget. After putting in immense hard work and effort, dreaming of nothing else for years and looking at failure when you have absolutely zero control, it shows how cruel life can be. I look at myself and things going on right now, and could easily be in the same position, just not so public. Please everyone, tell me the truth about the weather, I always pack incorrectly! It is not hot and sunny, it is cold and rainy..! 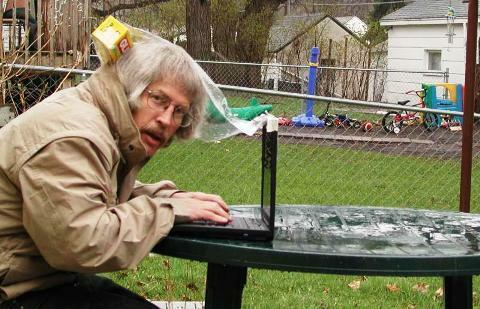 Obviously that is not me, merely a picture of someone trying to enjoy the benefits of working outside..in the UK! I have just finished a telephone “conversation” with Ryanair and have to come to the conclusion that they are the worst company for after sales support anywhere. 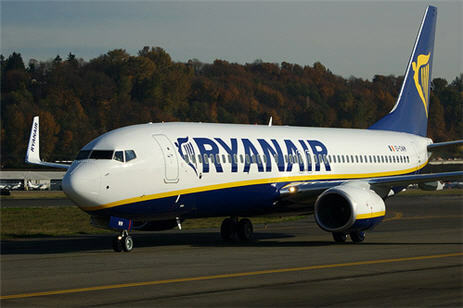 For those of you reading this from outside Europe, Ryanair is a low cost airline, offering flights around Europe for as little as $1 each way..
First problem they have is the total lack of anyway to contact them by email. Before you fly, you are forced to either view their FAQ’s or call either their reservation centre (at £0.10 per minute, here is the kicker, it always takes a minimum of 5 minutes to get to actually speak to anybody) or their internet support team at a whopping £1 per minute..
You see, dear reader, this is the clever part, when using Ryanair, the problems are generally Internet related. Their site recently relaunched and frankly the relaunch was dreadful, they removed half the features, emails were not being sent to confirm one had made a booking and the site crashed continuously. So my latest Ryanair experience was another web related issue. I checked in online and the site automatically picked up my birthday as my passport expiry date, it did so just after the page crashed on me, clearly indicating another Ryanair web problem. I called the £1 per minute line and (not surprisingly) the call was answered straight away, they don’t want you hanging around, at £1 per minute, they want you talking to them.. So the guy that answered started off angrily asking me what my home address was and what telephone number I used on the booking, standard security questions. I then told him the problem and asked if he could manually change the passport date “No Sir, you screwed up and inputted the wrong date”, not the kind of language I would expect to hear coming from a £1 per minute support desk. I explained the site crashed on inputting details and maybe this was the problem? “No, you inputted incorrectly”, this is strange because I travel with them twice per week and I kind of know how the site works! So I dared to question the stability of the site and the fact the link was a dead one not a link to online checking in, the “support” guy then replied “we have zero problems on our site, so it is user error”. So, instead of trying to look at the situation, I am repeatedly told it is my fault. And then, and this is the point I had to blog about, he hung up. The guy was so helpful and friendly that he actually cut the conversation and hung up the phone. So, Ryanair, answer me this, how do you train your staff, in fact, are they trained? I have never ever been called a liar and been hung up on when calling customer services, ever, and doubt any of my readers have either. At what point does all the bad publicity online make you sit up and take a look at the underlying issues? 1. Have a general email support – send the person emailing an automated case number and a contact telephone number to chase after 5 working days if not resolved. 2. Have an emergency email support – as above but offer a premium rate number to call if no response within 12 hours. 3. Make staff use their names, that way the customer can note the name of the staff member, note the case number and you can either re-train the staff member or in the case above, fire the staff that are rude and clearly destroying your brand. 4. Employ someone to simply check all blogs/forums and complaints online and actually leave comments and interact with users/customers, offer rewards for good feedback. Many airlines in the US do that, and they are learning that us customers don’t actually want to complain, we simply just want help or support. Ryanair does what it says on the tin, you pay peanuts for short flights, you don’t go on board expecting anything apart from a seat and an affordable way to get around Europe. But when things go wrong, they should and must get their act together, I am not an isolated case and would love to write a good review on Ryanair one day. In fact if they ever come back to me because of this blog post, I will write a follow up. Would any other business be in existance with customer service like this? Can you imagine ordering a sofa online and the system has a bug, and you end up ordering the wrong size or colour? Can you imagine having to pay £1 per minute to be told it was your fault, tough luck..? I’d love to hear your examples (if you have any) of bad customer service, I’d be amazed if you could beat mine. but then again, nothing surprises me anymore!